Is there such a thing as casual elegant? Upscale comfort? 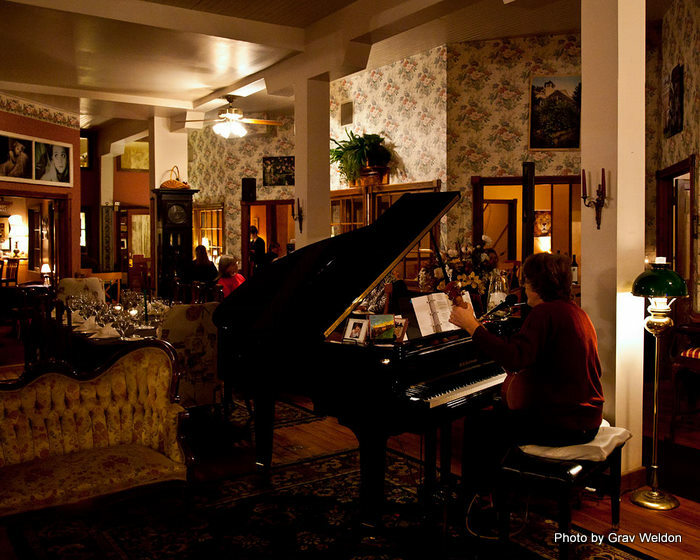 There must be a word somewhere for the sort of atmosphere you find at The Grand Taverne in Eureka Springs. The restaurant is housed in the historic Grand Central Hotel on Main Street, down in the valley. The building has a great history to it, dating back to 1880 as the place where passengers first arrived after deboarding trains that had come down from the North. In modern times the facility was renovated top to bottom in 1987, updated with fine suites for guests upstairs and a full service spa and salon downstairs but somehow maintaining that Victorian era grandeur. The restaurant itself was named after the very first full-menu service restaurant that offered table service -- Le Grande Taverne de Londres, opened in 1782 in Paris. The name was chosen to convey a sense of attention to detail on food quality and service. 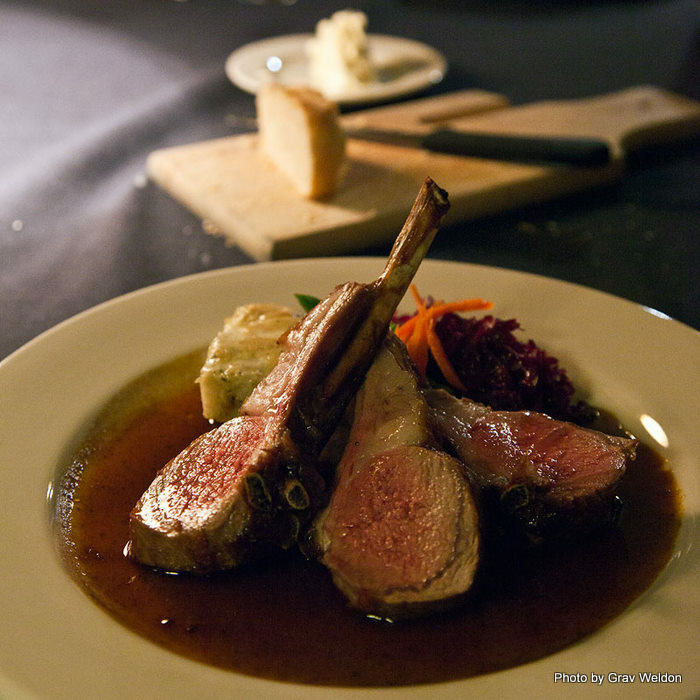 Its chef, Dave Gilderson, was schooled at L’Ecole de Cuisine Francais Sabine de Mirebek in England. He apprenticed in the south of France before returning to the states and working his way up through a number of assignments, including Branson’s Big Cedar Lodge and his first stint as Executive Chef at The Candlestick Inn. Gilderson came to the Grand Central Hotel to open The Grand Taverne in 2003. I’ve enjoyed fine dining at The Grand Taverne before. It’s where my husband and I celebrated our 10th wedding anniversary in 2009 during one of Eureka Springs’ grand Food and Wine Weekends. That was a fantastic meal of beautiful foods -- a Duck Confit with bitter greens and Madeira cherries, a lightly spicy butternut squash soup, Grilled Veal a la Perigordine and a fine selection of paired wines. As always I chronicled it in my notes and took photographs -- but when I returned from the trip and looked through what I had I realized I could not do the restaurant or its chef full justice because I had not taken lighting into account. My photographs were just not up to the job. I promised myself that when I got the chance I’d go back and chronicle another meal there -- but take someone along who could properly photograph the food. I’m so glad I had the chance to be hosted at the restaurant this January… to get another chance to celebrate a meal there and relate the experience to you. The first thing I noticed when we came in was the music. There was a small group of people who were chatting back and forth with the pianist, who was popping along with some of the greatest tunes of the singer songwriter era. I was glad we were seated within ear and eyeshot of the piano, but I would have a greater surprise later on. Turns out the musician we enjoyed that evening was none other than Jerry Yester of the Lovin’ Spoonful. That’s right -- he even played a couple of the group’s greatest hits for us over the course of the evening, including “Do You Believe In Magic?” and one of my favorites, “Summer in the City.” He also cranked out hits from other artists and did a rendition of The Eagles’ “Desperado” -- a parody called “Avocado” that seriously cracked me up. Being on-duty, I passed on the offered wine for my traditional iced tea. 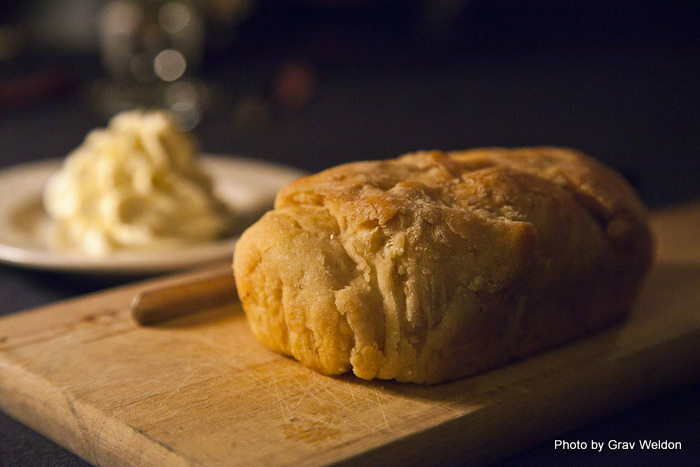 We started off with the fabulous house bread and butter. The bread is a rustic, light flavored pastry; large of crumb, it was moist and delicate but strong enough to stand up to a cutting knife. The butter was sweetened with honey, and the combination of the two was pleasant and hard to put down. Choosing what to dine on was a little difficult. The Pan Seared Sea Scallops with lobster butter sauce ($11) looked tempting, as did the Pan Seared Crabcake with smoked tomato remoulade, creole red pepper cream ($13). But we both opted for more salad-y things. Grav chose the simplicity of a Classic Caesar Salad ($6). 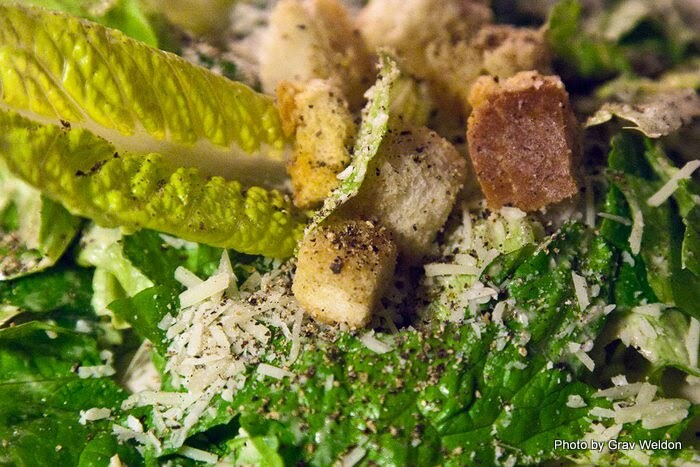 It was a fine selection of crisp greens tossed in a housemade dressing with grated parmesan, croutons and fresh cracked black pepper, a good example of how the salad should be prepared. 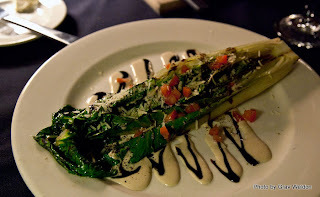 I chose the Grilled Romaine Heart ($8), which came dressed with chunks of Roma tomato and Parmesan cheese drizzled with both Caesar dressing and a balsamic reduction. The romaine had been grilled just to the point of bringing out the flavors, wilty but not mushy. The inspired combination of savory Caesar dressing and tangy-sweet balsamic glaze did not overpower the dish but elevated it to a level of elegance you don’t traditionally expect from a salad. It was mighty pretty, too. We debated over the menu briefly, each of us having narrowed down our selections to the same two menu items. It was almost a flip of a coin to determine who would choose the Roasted Rack of Lamb (Cointreau mint sauce, gratin dauphinois potato, $39) or the Classic Preparation of Half Duckling (Blueberry citrus jus, dried cranberry wild rice, $28). Both were equally appetizing. We agreed to sample and share. I drew the duck, and I am so glad I did. It was, without a doubt, the best thing I’d tasted that month. 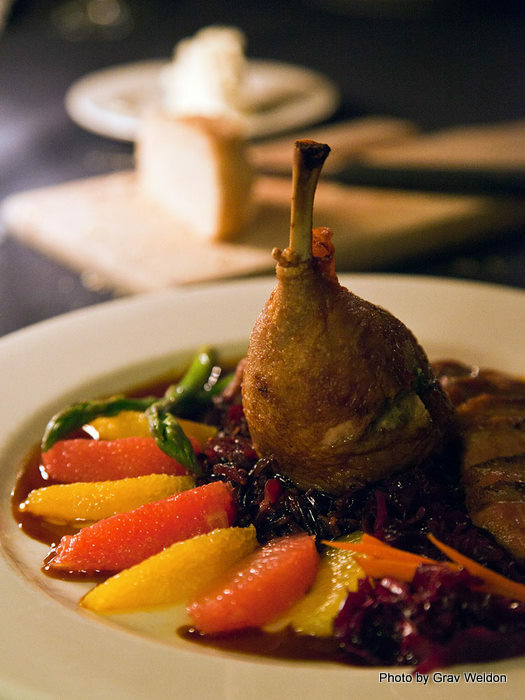 The first bite I was overtaken with a range of flavors that started with blueberry and citrus, a light pepper, red wine and the richness of red-meat duck. 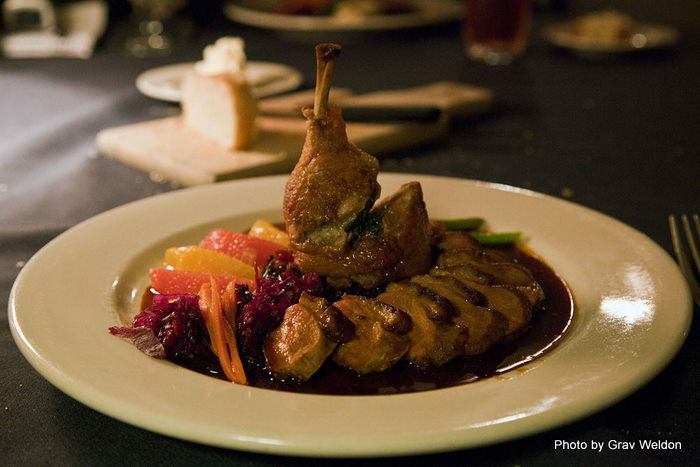 I had started with the breast medallions and was ever so pleased with the flavor and texture -- meat that literally melted on the tongue spiced and marinated by a chef who understood the nature of duck. 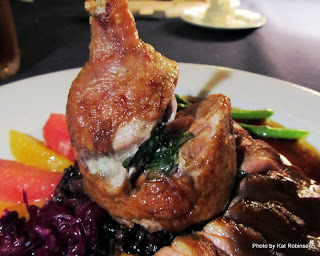 As much as I was thrilled with this, I was surprised by the entirely different preparation of the leg -- stuffed with spinach and herbs and completely savory, compared to the sweetness of the breast. The cranberry wild rice was augmented with a sweet wine-soaked cabbage that almost blended into it in the subdued light. The dish was served up with an attractive display of orange and grapefruit segments. The lamb, on the other hand, drew mixed reviews. I was quite taken with the lovely balance of flavors of orange and mint in its crust. The meat had been cooked just up to rare, a warm center, three well-filled lightly trimmed bones with an ample amount of flesh and not too much fat. At first I thought a similar red wine sauce had been used for both, but there were subtle differences. 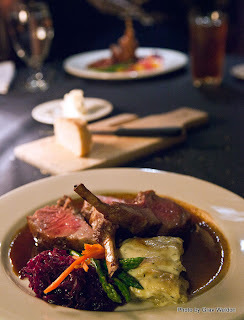 The lamb’s glaze was sweeter, and here there were also those slivers of sweet wine-pickled cabbage. The glaze might have been a bit too sweet for the dish but the side item -- paper thin wafers of potato layered between buttery creaminess -- were tasty. On the dessert menu we found a selection of five dessert martinis ($8) -- chocolate, coffee, Grasshopper, Golden Cadillac and Brandy Alexander. I demurred on these, tempting as they were, because driving was in the near future and I’m a hopeless lightweight. There were three choices on the dessert menu that night -- a flourless Chocolate Paradise, White Chocolate Crème Brule and a Montrachet Goat Cheese Cheesecake. We sampled the latter two. 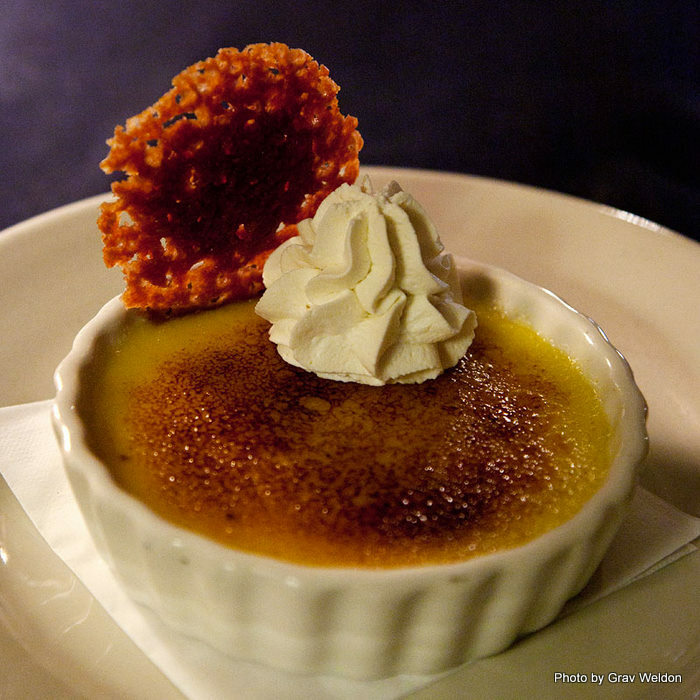 The crisp top to the Crème Brule was a perfect layer of burnt sugar. The flavors beneath were a little odd to me, strong on notes of cocoa butter and with an almost slick texture. 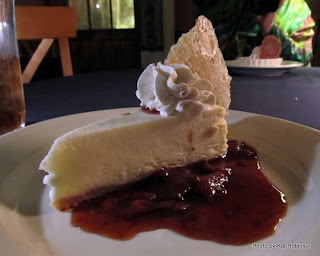 It did not compare to the cheesecake, which was one of the richest cheesecakes I have ever had, with a delightful sharpness that played against the sharp tang of the splendid strawberry balsamic reduction pooled at its base. The lemon cracker applied to the edge was sweet with no tartness and very light, perhaps as a counterpoint to the dish. Perfect cheesecake texture, unusual flavor juxtaposition but it worked so well. I had discovered I’d come to the end of yet another perfect meal from Chef Gilderson. It made me a little blue. On the other hand, I was stuffed and starting to feel the drowsiness a good meal brings on. Our fabulous classic rock musician jammed on comfortably as we took our leave. I understand fully why so many of my friends in Eureka Springs say this is the place they go for special occasions. The Grand Taverne has a measure of the gentry about it, very high-class and handsome but still accessible to all. This is where you should consider bringing your date for that special evening. 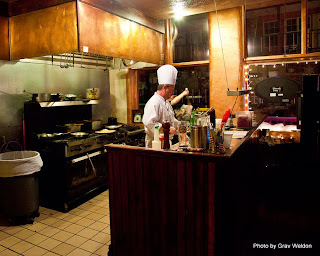 You’ll find The Grand Taverne inside the Grand Central Hotel in Eureka Springs at 37 North Main Street. Call (800) 344-6050 for more information or check out the hotel’s website.